Imagine crystal clear water lapping at your toes, the crisp soft virgin white sand under your feet, and the sound of the waves gently breaking on the shore around you, loved ones watching as you stand under your own private altar looking up at the clear blue cloudless sky. Beach weddings in Bali provide exactly this experience, on some of the most exotic and beautiful beaches anywhere in the world. 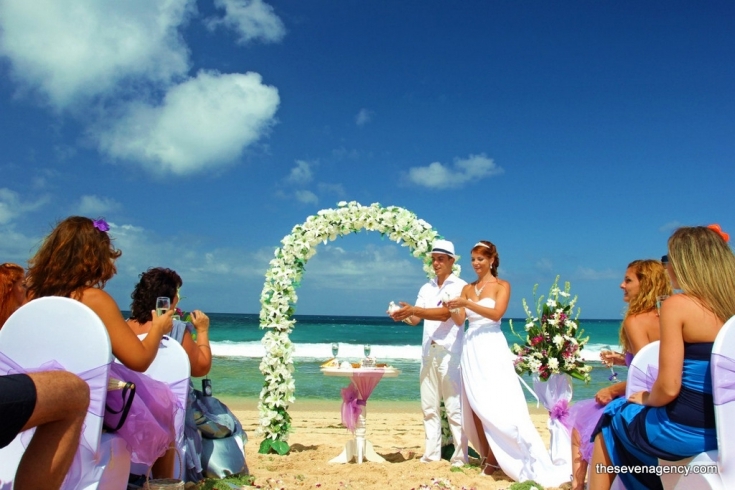 Bali beaches are usually very private and provide an intimate location for you and your wedding party. The Island also has excellent high end four and five star hotels, which usually have their own private beaches at the resort allowing you the opportunity to have the best of both worlds, a romantic beach wedding with great service and luxury accommodation. Private beach weddings are great as they can allow you to cater for many guests in a fantastic location, surrounded by the true beauty of nature; not only this but they can be incredibly elaborate, or really very simplistic the choice is up to you exactly how lavish, or basic, you wish your ceremony to be. The location lends itself to blues, and greens, in terms of alter colors, however again with a beach wedding package the choice is yours. With so many simply stunning beach wedding venues in Bali you are spoiled for choice, and it can be difficult to choose, so here at the Seven Group we have chosen only the very best beaches which offer the amenities, the location, and of course the experience you want in a wedding venue, you can choose between a classic wedding on a Jimbaran beach with a seafood buffet for you and your guests afterward, a wedding on a private beach near Uluwatu with its own reef and Michelin star restaurant, a ceremony in Nusa Dua and have your wedding in five star opulence at The Mulia resort, or head slightly further a field and exchange white sand for black in Lovina; whatever your preference we are confident that we will have a package to match it. Bali beach wedding packages are a great way to make sure you get the very best from your beach wedding in Bali, they allow you to choose the location, the decorations, the style of alter and also the type of theme you wish your beach wedding to be conducted in. At the Seven Group we pride ourselves on providing the best beach wedding packages at incredibly competitive rates, our dedicated team of wedding planners will make sure that your every wish is catered for, and by using our user friendly website you can easily select the perfect wedding package, and custom design the features you want. We also have photography, and makeup team which is second to none, meaning you will cherish these pictures of your special day forever. If you want the best packages, a professional team, extra benefits, and truly magical locations then a private beach wedding package through the Seven Group is a clear winner, come and see our great range of wedding packages and allow us to make your beach wedding on Bali simply unforgettable.